Yes, the photon. While a nonzero photon mass has been under experimental and theoretical study for years, the possible implication of a finite photon lifetime lacks discussion. 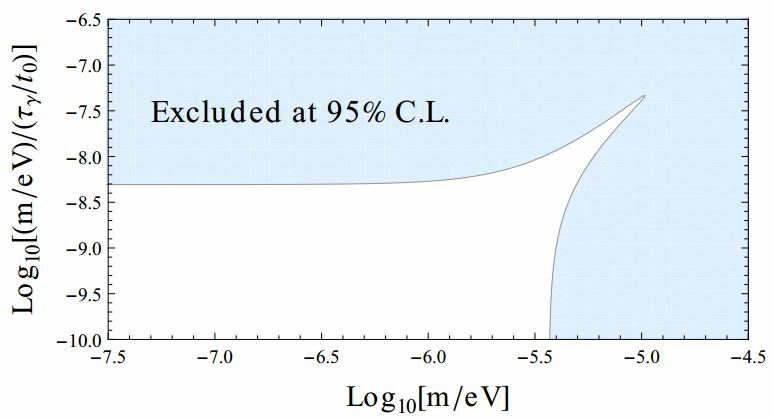 The tight experimental upper bound of the photon mass restricts the kinematically allowed final states of photon decay to the lightest neutrino and/or particles beyond the Standard Model. We discuss the modifications of the well-measured cosmic microwave background spectrum of free streaming photons due to photon mass and lifetime and obtain model-independent constraints on both parameters—most importantly a lower direct bound of 3 yr on the photon lifetime, should the photon mass be at its conservative upper limit. In that case, the lifetime of microwave photons will be time-dilated by a factor order 1015. This entry was posted in High Energy Physics and tagged photons. Bookmark the permalink.